Eagle-Straps are made for one-trip use and have been developed to offer a preslinging alternative with definite economic and practical advantages over conventional slings or straps. "E-S" are endless, preformed, semi-rigid loops that are remarkably easy to handle and use, and are available in different sizes and lifting capacities. 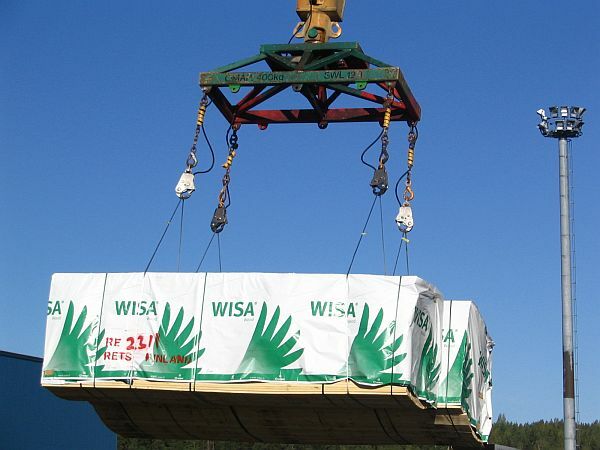 Eagle-Straps are mainly used for loading sawn timber packages and utility poles, and are usually applied to the cargo on the quay just prior to ship loading. They may remain with the load from the first hoisting until the last hoisting, whereafter they are removed and disposed.